The Notorious Meddler: "So Long Lance Russell (You Just Wait Till Lawler Hears About This!)" "So Long Lance Russell (You Just Wait Till Lawler Hears About This!)" Professional wrestling's greatest announcer ever has died. 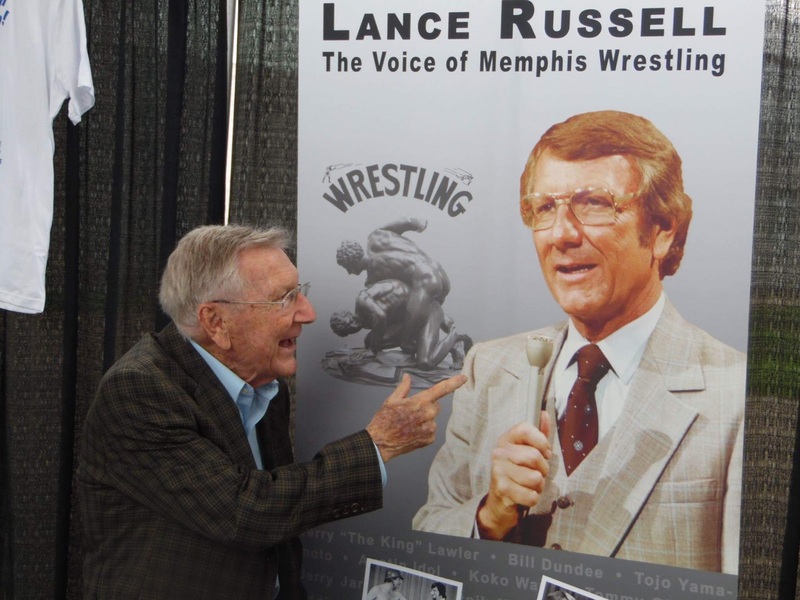 Lance Russell, one of wrestling most treasured voices died Tuesday morning (Oct. 3rd) at the age of 91, after complications from a fall. He was hospitalized after breaking his hip in a fall on Friday, which was the second time he had fallen last week. Friday was also the day that Russell's daughter lost her battle with cancer. There is a special place in my heart for the radio and TV sports announcers I grew up with. From ABC's Wide World of Sports to roller derby and everything in between, sports was always a big part of my life. At my house, we watched on TV whatever sport was 'in season,' especially on Saturday's. For me, there was no better way to spend Saturday than with Lance Russell. Jerry "The King" Lawler may have ruled the wrestling circuit based in Memphis, but Lance Russell WAS wrestling. Legendary doesn't even begin to describe their impact. What they were able to accomplish, I am proud to say, definitely had a big effect in me growing up. 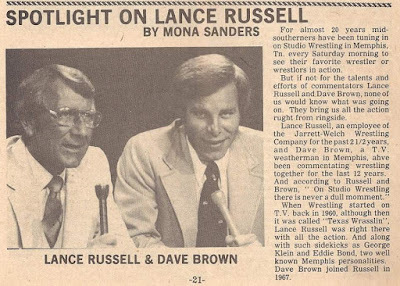 Russell was a television program director when he put wrestling in its Saturday morning time slot in Memphis where it had great success and he was also the ring announcer. It was my favorite program to watch on Saturday. Russell, who announced matches in the Memphis region from 1959 to 1997, for the NWA Mid-America and the Continental Wrestling Associations, was best known for his relaxed announcing style, as well as the much-used phrases, "By golly" and "Son of a gun." His co-host for more than two decades was Dave Brown, a college student and disc jockey, and later, TV meteorologist. While he was definitely a star, Lance Russell never found himself in the position of being a bigger than the wrestlers he worked with. That list runs long: Lou Thesz, Jackie Fargo, Jerry Lawler, Jimmy Hart and Randy Savage, to name a few. 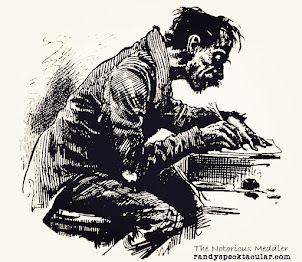 Russell would get up from his chair to conduct interviews, walking around to the front of the desk. It was common to see one or more of the heel wrestlers demolish the set or even run roughhouse over Russell. These interviews were often the highlight of the Saturday morning television broadcast. Russell also literally rang a bell to begin matches, in addition to pounding it loudly in futile attempts to halt out-of-control melees in the ring. He used the mic to chastise and exhort wrestlers during their match. He often encouraged other wrestlers to run in from the locker room and offer assistance. 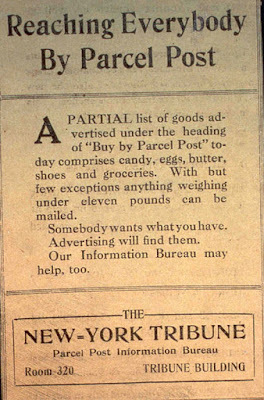 His famous one-liners were "Don't start with that smart stuff" and "Will you guys just stop and get out of here?" or this one: "You just wait until Lawler finds out about this!" Lance Russell and Dave Brown have been described by wrestling insiders and fans as the greatest television announcing team in the history of wrestling. 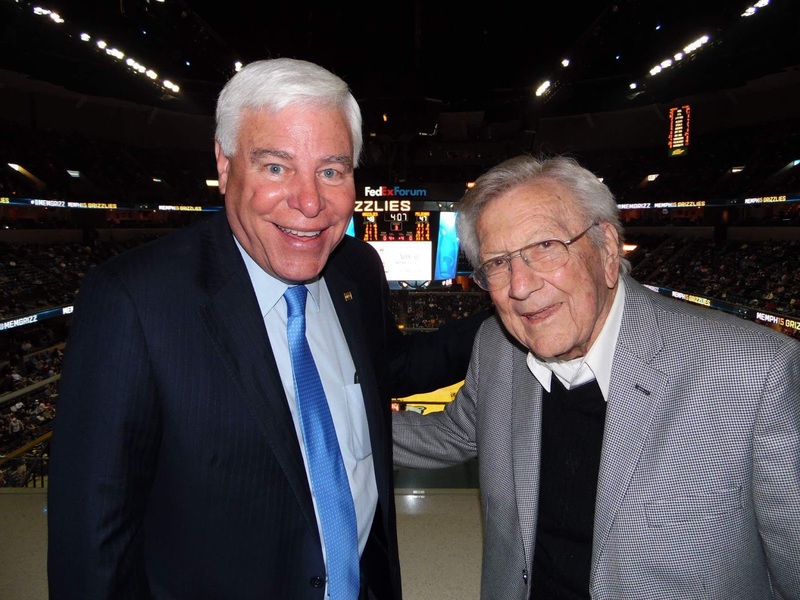 After Russell's death, his long-time partner tweeted, "My lifetime friend, Lance Russell died early this morning. I cannot express how sad I am. He was responsible for my TV career success." By golly Dave, I think you're right! 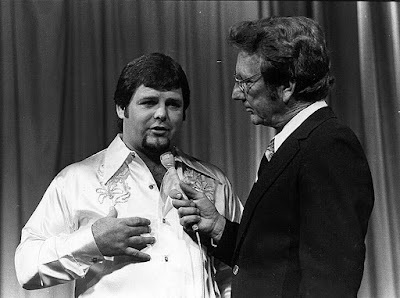 On a personal note, from someone who has followed pro wrestling his whole life, especially those great days of yore when wrestling in this region was as great as you could find anywhere, I suppose that if God said it had to be this way, it is only appropriate that we said goodbye to Dale "TNT" Mann and Lance Russell in the same year. They were my heroes. Sad. Fats Domino - The Real King of Rock N Roll?